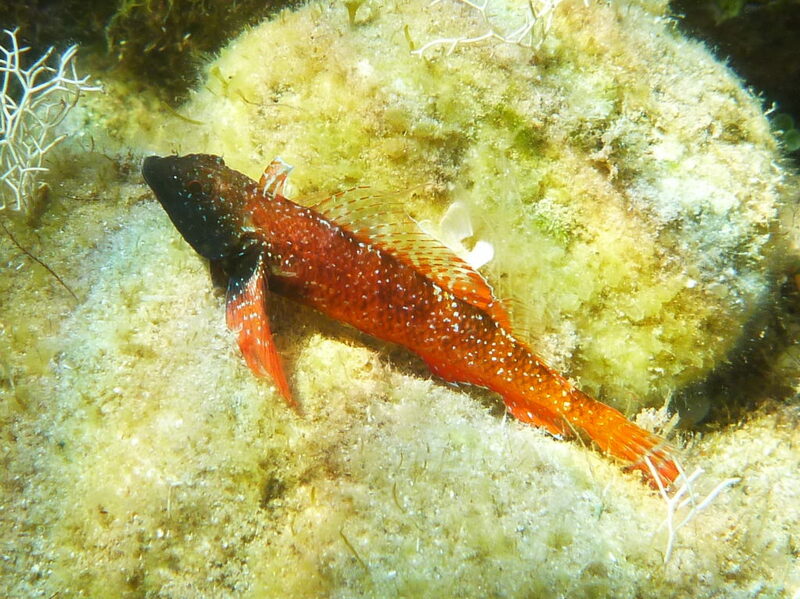 Last week’s CORAL Newsletter teased a beautiful “little red Corvette” of a mystery fish, this stunning bottom-dweller from the intertidal zone, which is a fish few have likely seen or might recognize. 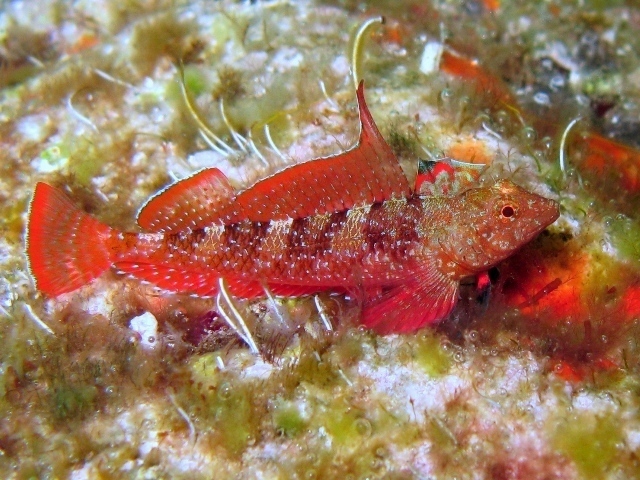 We left out one important detail: the Red-Black Triplefin Blenny (Tripterygion tripteronotum, sometimes misspelled as T. tripteronotus) is a native of the Mediterranean and Black Seas, not exactly prime collecting locations for the marine aquarium trade. The small mature size and sexual dichromatism of the Red-Black Triplefin only add to the allure of this fish! 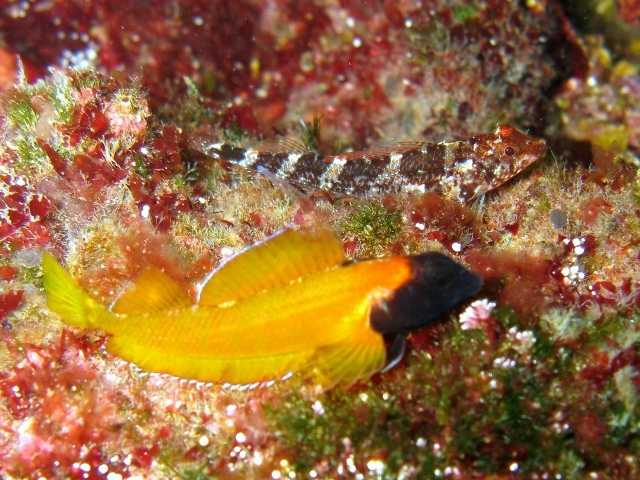 Another example of the juvenile & female coloration of the Red-Black Triplefin. Image Credit: Roberto Pillon, CC BY 3.0. Fishes from the Mediterranean tend to be viewed as “coldwater” or subtropical marine aquarium fishes; as such, the main interest in them mostly comes from the institutional world of public aquariums. However, before you write this species off completely, CORAL Magazine has in fact covered this and other related fishes from the Mediterranean in our pages before. 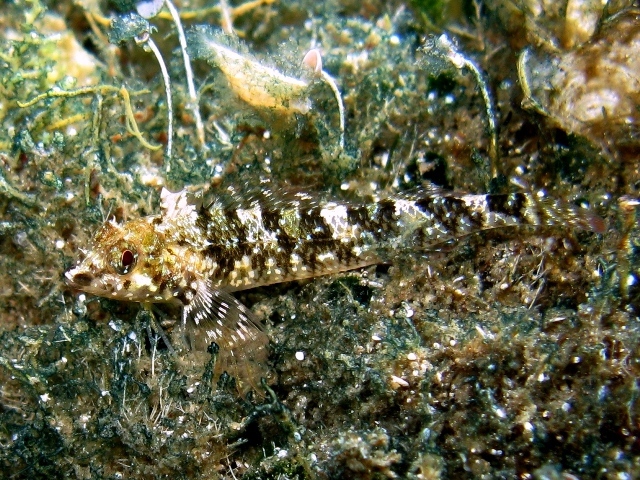 Specifically, Mediterranean Blennies in Nature and in the Aquarium by Harold Weiss, published in the BLENNIES issue of CORAL, the April/May 2008 issue. With such a stunning fish, one has to ask, could we keep them in our aquariums? Before we dive into some care information, it’s worth noting that the Suez Canal, which links the Mediterranean with the Red Sea, has allowed for the exchange of species between these two bodies of water. Several fishes we recognize as tropical coral reef dwellers have become established in the Mediterranean, including Lionfishes (Pterois miles and P. volitans), Bluespotted Cornetfish (Fistularia commersonii), Rabbitfishes/Spinefoots of the genus Siganus, and two corallivorous butterflyfishes which have adapted to life in the wild without the availability of their normal diet, the Hooded Butterflyfish (Chaetodon larvatus) and the Blacktail Butterflyfish (Chaetodon austriacus). Multiple Angelfish species have been encountered in the Mediterranean, including the Maculosus or Map Angelfish (Pomacanthus maculosus) and Emperor Angelfish (P. imperator), although it’s unclear if these have established reproducing populations. But the Suez Canal is not the only route available for colonization of the Mediterranean by non-native invaders; slow-moving oil rigs serving as mobile reefs are thought to be responsible for the spread of hitchhiking Atlantic Angelfish species, including the Queen (Holacanthus ciliarus) and the Guinean/West African Angelfish (H. africanus). There are many more non-native species making headway into the Mediterranean; these are just the species that marine aquarists will likely be familiar with. Why mention this invasion? Well, the establishment of tropical species in the Mediterranean might suggest that native fishes sharing the water with these invaders might actually perform acceptably in the aquarium hobby. 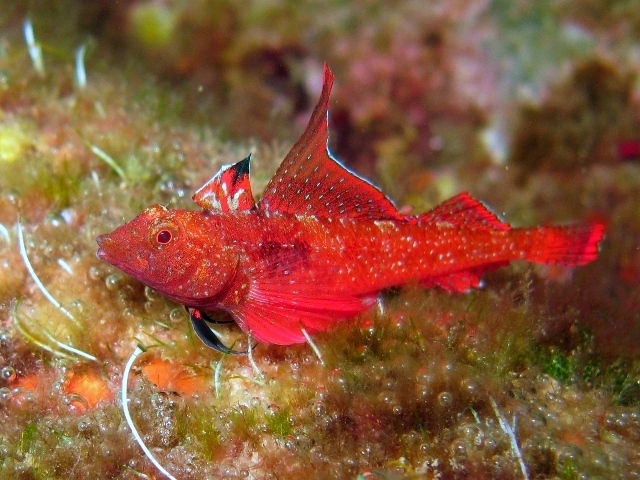 So while a species like the Red-Black Triplefin is likely to be viewed as a coldwater species, its wide range along the entire coast of this sea suggests that specimens collected from the south, particularly closer to the southeast by the Suez Canal, are probably better thought of as subtropical populations that would do well in home aquarium care. 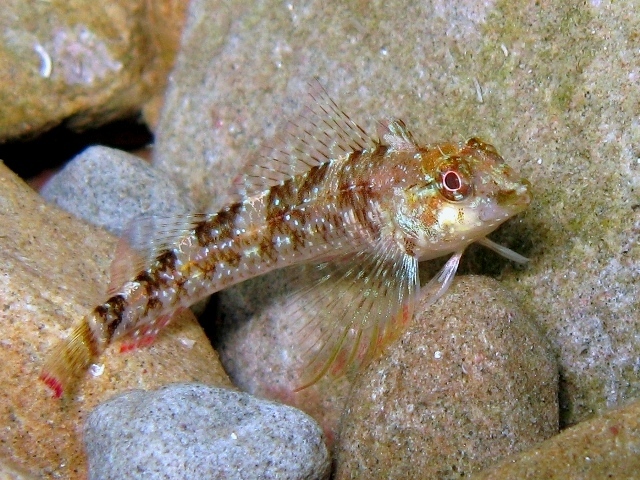 While a single blenny is probably not enough to warrant the entire establishment of an aquarium collection outpost in the Mediterranean, if the populations of other ornamental foreign invaders are established and of sufficient size, one could argue that a fishery which targeted them for the aquarium trade might not be a bad thing, and maybe we’d have access to some interesting new species for breeders to work with as well. Of course, for all we know, the Canal may have already allowed for an apparently tolerant species like the Red-Black Triplefin to make its way into the Red Sea…perhaps collectors should keep an eye out for it! 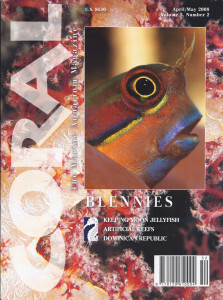 CORAL Magazine, April/May 2008, includes Harold Weiss’ full article on the aquarium care of numerous Mediterranean blennies. Available exclusively as a printed back issue: click cover to order it for your CORAL collection today! Turning to the pages of CORAL, Harold Weiss offers an in-depth look at the husbandry of these temperate blenny species. He pays particular attention to the issue of temperature, which could be important depending on where these fishes were collected, or if one is hoping to initiate seasonal breeder patterns. “Temperature deserves special attention,” begins Weiss. “The Mediterranean lies in the temperate zone and is subject to a completely different climate than the tropical oceans. While water temperatures rise significantly during the summer, they drop quite a bit during winter. Shallow bays, as well as tidal pools (often populated by blennies), may reach 86 degrees Fahrenheit (30 degrees Celcius) or more in the summer. Therefore, higher temperatures in a tank for blennies during the summer won’t do any harm (unless the animals are those that live in the lower layers of the ocean). In the winter, however, the northern Mediterranean (that is where most of the animals in our [European] aquarium will come from) can reach freezing temperatures on the surface, and lower layers will keep a more or less constant temperature of around 57 degrees Fahrenheit (14 degrees Celcius)–in their natural habitat, this is where the fish take refuge during the cold season. While Weiss’ husbandry notes and the general lack of availability of the species are probably enough to put most aquarists on the path to more accessible species, there are always aquarists seeking to venture into new territory or go well off the beaten path. If you’re on the fence, the following video examples of the species in the wild might be what it takes to push you over the edge! 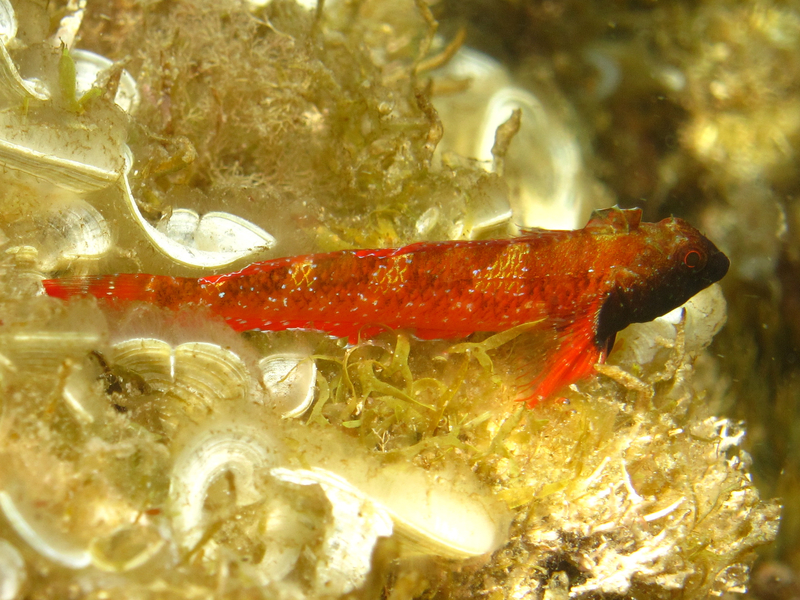 You can learn a little bit more about the Red-Black Triplefin in our original Mystery Fish post. 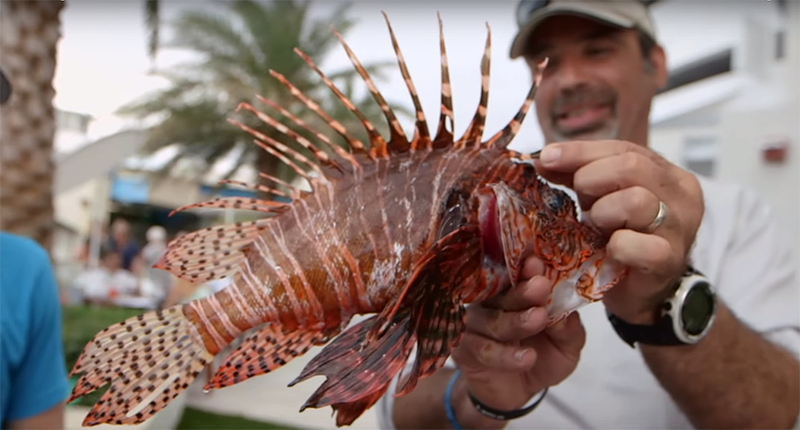 But if you’re simply not a fan of bright crimson fishes in general, the Mediterranean holds another secret for you. The related Black-faced Blenny, Tripterygion delaisi, might have your heart racing. And while these triplefins may never find their way into the aquarium trade, you can always discover more information on tropical Triplefins, including the recent description of a new species from the Caribbean. A Bonus Look at the Black-faced Blenny in the Wild! First record of the Red Sea Orangeface Butterflyfish Chaetodon larvatus Cuvier, 1831 in the Mediterranean – https://www.researchgate.net/publication/273607199_First_record_of_the_Red_Sea_orangeface_butterflyfish_Chaetodon_larvatus_Cuvier_1831_in_the_Mediterranean?